Day X3 protests in Glasgow saw hundreds of students join their comrades across Scotland and England in taking to the streets to protest against the proposed rise in tuition fees down south and the government´s destruction of education. 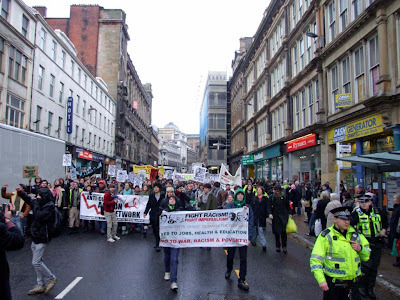 The turn-out did not match the size of other demonstrations (tuition fees are still free in Scotland) but more than matched their militancy in one of the angriest and effective days of action in the city since the early days of the anti-war movement. FRFI supporters played a leading role in direct action throughout the day and two were arrested and detained by police, and on 10 December plead not guilty to serious charges of breach of the peace, obstruction, assault on a police officer and attempting to free a person in custody. Then the real action began. Unlike the respectable strolls which normally pass as “protest”, a spontaneous march then set off, the half dozen cops in attendance for once confused and outnumbered. There were no preplanned rallies by trade union bureaucrats and Labour party politicians to divert things into respectable dead ends. The example of Milbank and the London protests, as well as the direct actions and university occupations in Scotland in recent weeks, clearly inspired students to take matters into their own hands. Throughout the day, protestors reclaimed the streets of the city centre, initiating a massive police response as the authorities completely lost control of the situation. Protestors targeted those symbols of the British business establishment which are the driving force behind the brutal assault on the country´s public services. The protest grew to hundreds strong as increasing numbers of students and members of the public, young and old, joined rolling pickets which occupied and blockaded Vodafone shops, branches of RBS, Bank of Scotland and Clydesdale, targeted Topshop and the British army recruitment office, tried to occupy Glasgow School of Art, took over roads and blocked intersections. Chants of “Whose streets? Our streets!”, “You say cut back! We say fight back!” and “You can shove your royal wedding up yer arse!” rang out through the town. At one point the crowd successfully struggled with police to de-arrest an FRFI supporter the cops had grabbed hold of. Throughout the day, the true role of the police was exposed to many for the first time as they violently and aggressively focused on protecting business, sacrificing the safety of demonstrators and members of the public. Police lines and kettles were broken through on at least a half dozen occasions as the tactics of the street were learnt; riot vans, hundreds of police and a helicopter rendered totally insufficient to contain the people´s anger. On Sauchiehall Street, midway through the protest, police tried to regain control and violently assaulted and arrested an FRFI supporter. A violent struggle ensued as the crowd attempted to free him, police lashing out, pushing young women to the floor and hitting one 14 year old FRFI supporter in the face. The arrested comrade was assaulted in the police van, suffering bruising and cuts, as four officers restrained him. Cries of “police brutality” rang out as the police van drove into protestors surrounding the van in the street´s pedestrian area. Another FRFI supporter was arrested at the very end of the demonstrations, picked out on exiting a kettle in George Square. The scenes in George Square leading up to this saw police again use extremely aggressive tactics, assaulting and kettling a small group of peaceful school students, and shoving other female school students just crossing the square. After being taken to Stewart Street police station, one comrade was unnecessarily strip searched and both interview by plain clothes CID attempting to solicit information on “leaders”. Although both granted bail, one is now banned from the city centre. The arrests of the two FRFI supporters were the only ones on an excellent day of action. Students and young people in Glasgow, following weeks of university occupations and direct actions, have sent a clear signal that anger and militancy has reached a whole new level; a new movement is being born as the class lines are drawn. The two FRFI supporters detained were the clear targets of political policing and a campaign has been launched in their defence. Other young activists in Glasgow are already facing banning orders and jail sentences relating to political activity here and in London. We stand fully with all those attacked by the British state and will defend them until the last. Victory to the resistance!